The New York Times announced Wednesday that within one year it will start charging for access to its site, NYTimes.com. Print subscribers will retain free access, but other readers will need to pay a flat fee for unlimited access. The paper will use the metered model of pay wall wherein site visitors can read a certain number of articles for free each month before being charged. Executives at The New York Times Company have not yet worked out certain details such as the price they will charge or how many free articles can be read before a paid subscription is required. After The Wall Street Journal and Newsday, this will make The New York Times the third among the U.S.’s largest newspapers to institute a pay wall. A few smaller publications also have one, including The Financial Times, The Arkansas Democrat-Gazette and The Albuquerque Journal. The New York Times Company said that the current decision is not a reaction to the recession in advertising, it is just a long-term strategy to develop new revenue. The paper lost $35 million in the third quarter of last year alone. “As painful as it will be at the beginning, we have to get rid of the notion that high-quality news comes free,” said David Firestone, a deputy national news editor for the paper. But not everyone shares Firestone’s perspective, and the announcement is eliciting a lot of debate. A meter that only asks the site’s heaviest users to pay will retain the vast majority of the site’s visitors and its opportunities to sell ads in front of them. But The Times has to be careful with those heaviest users, who are also becoming more and more important to ad sales on its site. Needless to say, it’s almost impossible to build ‘active communities’ behind a paywall. […T]he whole concept behind Times Topics is being broken by this paywall: they’re meant to be a landing page for people searching for information on a certain subject, linking to many NYT articles on that subject. But now those searchers won’t be able to read those articles, unless they’re already subscribers. As such, a project which was meant to bring nytimes.com into the same space as Wikipedia will now become largely irrelevant. There’s also no mention of what’s going to happen to the NYT’s many blogs[…] Suffice to say that the number of successful blogs behind a paywall is, at present, exactly zero. 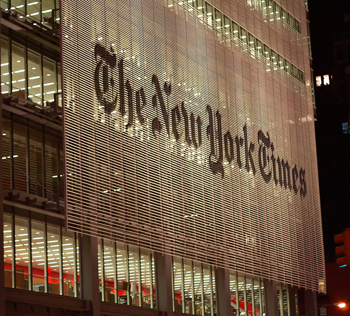 The New York Times has tried online pay models before, with little success. In the 1990s, it charged overseas readers, and later charged for access to editorials and columns from 2005-2007. Image by Digiart2001 | jason.kuffer on Flickr, used under its Creative Commons license.